I spent Halloween afternoon over in New York's West Village, being given a tour of a gut-renovated townhouse by one of the home's owners. While a description of the actual house will appear next spring in an article I'm writing for another publication, what struck me most was the opening half of the home tour. The homeowner and I stood there alone in the downstairs kitchen, as I listened to her describe what used to be there: the walls that got taken down, the halls that no longer exist, the lost backyard and the missing stairs. We were surrounded by a halo of absent spaces, rooms that had been cut out around the edges and removed. 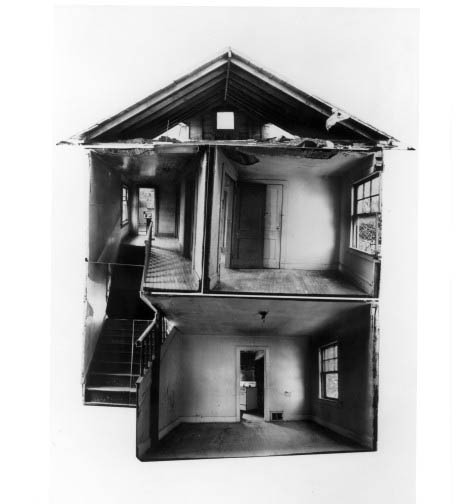 [Image: A photo-collage from Splitting by Gordon Matta-Clark]. And it seemed that you could put together a long and fascinating series of home renovation interviews, with people describing, from memory, the missing architecture around them: where rooms used to be, perhaps entire buildings. It'd be as much an architectural podcast as an experiment in narrative neurology: how former buildings are remembered and described. I have no idea how long this sort of thing could sustain anyone's attention, to be honest; but what might be called oral histories of missing space could extend from demolished buildings to whole war-destroyed towns, from renovated suburban homes to newly partitioned spaces in a nearby office high-rise. The point would be to tour buildings based only on what those buildings used to be. In a sense, it's the appeal of ruins. Perhaps you go on a camping trip to a distant country, where you hike deep into the desert, heading for a series of abandoned villages beyond the mountains northwest of the airport. They are Roman sites, some say, but others suggest a 2500-year old fringe culture outside imperial reach. Either way, as the group of you sits down to cook dinner around a fire—flames lighting up a circle of illegible building forms eroding back into sand—your guide starts to tell a story. The only thing he's describing, however, is an imaginary building that looms around you, he says, on all sides, with rooms, spiral stairways and halls, and the occasional door resting alone somewhere in the darkness, that no one has yet to open. Temples form in the outline of his story: things that used to be but are no longer. The description goes on for hours. You realize, when the moon disappears behind the mountains and your campfire has burned out, that you've been taken several hundred rooms deep into some massive, impromptu architectural edifice produced on the spot by the guide. Perhaps it could become an alternative oral tradition: buildings handed down, generation after generation, to form a kind of speculative-architectural harddrive inside of which a culture stores its myths. Great events remembered by the rooms they supposedly occurred within. In any case, it also seems like an interesting opportunity for an iPhone app... Instead of a Phantom City of the unbuilt avant-garde, it's a removed city of the various rooms that used to be there. You could walk into any building in the city and get descriptions and floorplans of the spaces that no longer exist. Renovation detector. Your phone starts to beep as you walk through missing walls. You might want to hook up with the Augmented Reality (AR) crowd (scifi authors Bruce Sterling and William Gibson both seem to think that it's the next it) for this idea. Collage together an interactive virtual locality experience from tales, photographs and video of the absent spaces, layered over what's there now. You could even get a clever monkey to take old photographs and do 3d reconstruction with them as textures to layer over reality. I believe you're familiar with the project that takes a current map of Manhattan and allows you to change the "time" you are looking at, back to the 1600s. (It's called the Mannahatta project for those unfamiliar http://themannahattaproject.org/ ). So take that concept but granulated to the level of individual structures and recent past. This could be of interest to museums too. "Take the virtual tour of year zero Smithsonian while on the real Smithsonian tour!" "View the L'ouvre through the window of time!" You could also do this with a crumbling castle - view it as it was originally built, hit the play button and watch as a reconstruction of its deconstruction plays back, and be able to walk around and view it from all angles. With modern buildings about to be torn down, the destruction process could be filmed and recreated for AR. Then the construction process as well, so you could see the old fall and be replaced. While this might not be very exciting as an AR device, as holographic displays start coming up, a company could have a hologram simulating the destruction and construction of their building as lobby art. Of course, our current generation of such things is rather toy-like, but it ten years or so our handheld devices will be yesteryear's supercomputers. Your post reminded me of the LA artist, Mike Kelley's 'Educational Complex' (1995). He tried to recall every school he ever attended and constructed a a psuedo-architectural model of all the spaces conglomerated into a single 'complex' with all the spaces he couldn't remember simply 'left out' and depicted as solid mass. The blind spots in this model represent forgotten ("repressed") zones, and so are reconceived by Kelley as sites of institutional abuse, for which specific traumas were devised. One thing to think about: what if this kind of thinking could be applied to a kind of retro-/pro-active mental matrix in which architectural landscapes return to their fabled pasts and evolve into their potential futures as part of one continuum. It would combine architectural mythography with the kind of "quantum-potentialism" that I was just reading in a great Medievalism blog pertaining to Beowulf (of all places!). It's video-lecture about the ruins of Grozny and the past presence of their impending (and now complete) destruction. What a trip! I would love to see this whole concept visualized, wouldn't you? an architectural phantom limb syndrome? sometimes when people are experiencing pain from a limb that is no longer there, like pain from clenching a fist, it can be cured by playing a video of a similar looking fist unclenching in the same location..
i wonder if someone could take these oral histories of missing architecture and make videogames to cure the architectural heartache of demolition.